where A - value in dBm, log - logarithm, X - value of the transferred power in mW. Optical power - power of transmitter's transceiver of any receipt and transfer optical device. Measured in dBm or mW. Standard transmitter power in PON is 4dBm (2.5mW) for OLT and 2dBm (1.5mW) for ONU (optical power permissible values are in the range 2 ... 7dBm for OLT and -1 ... 4dBm for ONU). Optical sensibility - sensibility of transmitter's transceiver of any receipt and transfer optical device. Measured in dBm or mWt. Standard sensitivity of the receiver in PON is -30dBm or 0.001mW for OLT and -26dBm or 0.025mW for ONU. Optical power budget - difference between value of transmitter power and receiver sensitivity at different ends of the link. Measured in dB. Standard optical budget for Class 2 PON shall ensure 25dB (allowable values of the optical power budget in the range of 25 ... 30 dB). * Optical power budget may be increased by using higher power transceivers on the side of OLT. Such transceivers have increased transmitter power and use more sensitive receiver that allows crossing the threshold of PON's standard optical budget . All GEPON transceivers are labeled by grade. Currently, there are four classes labeled using English letters and symbols, having power dependent on a seniority of letter and number of symbols. Attenuation - a process of losing power of the light signal in the communication line. The signal on the communication line is attenuated both naturally and due to inhomogeneities in fiber, splitter, kinks, mechanical damage, mechanical connectors, bonding, ambient temperature. Attenuation is measured in dB/km for fiber and dB for etceteras. Standard specific attenuation for G.652D fiber at a wavelength of 1310nm is 0.36dB/km, and at a wavelength of 1550 nm - 0.22dB/km. Standard attenuation for mechanical connection of SC / UPC-SC / UPC type is about 0.5dB, on bonding - 0.05dB. Main attenuation of PON network is made by dividers (splitters) - here attenuation can be from 4dB to 21dB and even more (depending on the number of outputs of the divider). Optical loss budget - total attenuation from the signal source to the remote receiver signal. Measured in dB. Maximum optical loss budget in PON is equal to PON optical budget. Maximum recommended optical loss budget in PON is equal to PON optical budget minus 3dB (these 3 dB are in reserve; it is recommended by all leading world integrators). Transparency window - a range of optical radiation wavelengths, where attenuation of optical signal in fiber is lower compared to other bandwidths. Calculation of data transfer rate in PON network is based on the fact that the customer is not always logged in network, and even being there, he does not always use the entire capacity of the allotted channel. We will carry out calculation based on the assumption that a single OLT's PON-port has maximum possible number of ONU (64 units) connected. A downstream rate is 1250Mbps, therefore, one ONU receives 1250/64 = 20 Mbps. We assume that simultaneously the network has 50% ONU connected - the rate per ONU is increased to 40 Mbps. Given the fact that not all users are actively using the communication channel (torrent, etc. ), we will assume that among all active users in a unit time the number of users actively downloading - 50%. According to the results, the rate per ONU will be about 80 Mbps. During Prime Time (lower network load time, early in the morning from 4 to 8), each ONU can receive up to 1Gbps. It is also necessary to take into account seasonal variations in customer requirements (during winter more customers are active in the network, especially in the evening, in the summer - they are less active). OLT, as the L2 switch, can limit the connection speed for each subscriber in the network, however, it is done not quite in a standard way. As noted above, each ONU, connected to OLT, is considered a "subport" of OLT, which determines the speed limiting process ("shaping"): the speed is "shaped" not on OLT port, but on optical EPON port of ONU or copper subscriber ONU port. PON concept initially assumes a tree topology, however, the reality is far from the concept, however passive "tree" frequently degenerates into a "bus" or a "star", depending on the geographical location of subscribers in relation to each other. In addition, degeneration of "tree"topology into derived topologies is affected by physical and legal factors (for example,it is very difficult to lay cable through the forest or legal framework does not provide cabling close to an object, and so on.). To construct any PON topology one uses a variety of passive optical splitters (splitters, couplers), which can be divided into two groups (manufacturing technology): welded and planar. Dividers, made using any of the technologies, can be further classified by a number of input waveguides (pigtails). There (inputs) can be two (X-shaped dividers) and one (Y-shaped dividers) of them. The first are used to introduce CATV into passive network (one input is fed with CATV, the second is used for duplex communication between OLT and ONU), the second are standard dividers for 1 input and N outputs. Number of outputs is always N ≥ 2. Welded dividers are produced by FBT technology (Eng. Fused Biconical Taper). This technology is fairly simple and does not imply presence of expensive equipment and complex/capacious time process. A feature of FBT technology is getting divider with unequal division ratio of output power (e.g., 40/60 or 20/80 or even 1/99), expressed as a percentage. the tests results into passport containing information about serial number, manufacture date and optical characteristics (attenuation, return loss, etc.). In theory, after all these actions the splitter is ready for sale and may be packed, but at this stage it has no connectors, which means that it can not be mechanically connected (only welding). Therefore, often the process proceeds further: all necessary connectors are welded to the "ends" of the divider (SC / UPC, SC / APC, LC / UPC ... underline as necessary). After welding the ferrules of connectors are ground on a special machine, the splitter is tested again and finally packed in blister or PU foam (optional). A feature of FBT dividers except percentage division, is a presence of several so-called "transparency windows" where an optical signal has the lowest attenuation. Modern FBT dividers has three transparency windows: within the following wavelengths: 1310 nm (1310 ± 40 nm), 1490nm (1490 ± 10nm) and 1550nm (1550 ± 40nm). This allows using passive network built with FBT dividers, not only as a path to transmit GEPON data (1310nm and 1490nm), but also for CATV transmission at wavelength of 1550 nm. For welded dividers, a number of outputs is equal to two (N = 2). This statement is directly related to the manufacturing technology, and any other FBT divider with the amount of outputs N> 2 is likely a combination of two or more "heterobrachial" dividers 1x2. These dividers are usually factory mounted in a plastic box, so their size is always rather spacious to be uncomfortable to work, although the price of such divider is sometimes lower than for the same planar. Planar dividers are produced by PLC technology (Eng. Planar Lightwave Circuit), which is technologically more complex than FBT (respectively, and the cost of the finished PLC device is slightly higher than FBT). In fact, there is not so much (you can finger count them) companies manufacturing high-quality (and indeed any) planar chips. They are located far on the East (Japan, Korea, possibly, China). Planar chip manufacturing is a very expensive process and not many companies can afford high level optical specialists and expensive equipment. - application of waveguide material on the received blank. As a waveguide material it is possible to use, for example, a quartz glass or a specialized kind of plastic. The result is a "layer-cake" consisting of three layers (substrate-waveguide-reflector). As an analogy, you can cause a circuit board (core-prepreg-copper surface), and the actions performed with the "pie" will be similar to copper etching on printed board. - application of templates for dividers and etching (in a single pass a group of dividers with similar parameters) This stage defines volume of future splitter. After applying the template, the "pie" is immersed in a bath with a variety of acids, which "eat" everything except what is in the template. The result of etching is a group of "solid" glass waveguides (Figure 6). - on the structure, resulted from "the previous series" it is necessary to apply another reflective layer-shell, which completely covers the waveguide, preventing light signal to go beyond. - the structure is either left "as is", or covered with a protective layer (something like epoxy resin), and then cut into neat rectangles on finished planar chips. Then the second stage follows - assembling the divider. * Nowadays, technology of PLC chips development and manufacturing is quite well sophisticated. This allows manufacturing PLC chips previously inaccessible because of the manufacturing topology complexity or because of doubts on the feasibility of manufacturing products (e.g., 1x24 dividers are not so often used, respectively, manufacturers have developed this topology in the second and later stage). Today, PLC chips manufacturers are trying to "print" PLC chips with non-uniform attenuation at different outputs (for example, PLC 1 × 3 20/40/40), however, the feasibility of such actions is still under question. - attaching pigtail optical pigtails to inputs and outputs of PLC chip. This is done on a special machine, equipped with a microscope and drives, allowing to align the fibers with respect to the chip in three dimensions. After fiber is positioned, it is sticking to the chip. - as in FBT case, the splitter has testing stage and welding to pigtails connectors stage, than, provided with passport and packed, it is transported to customer. Each divider from these sets can be as X-, as Y-form (f.e. 2x8 or 1x8 respectively), that allows to use design engineer fantasy and equipment capabilities in full. The exception of PLC divider is not only larger outputs number (comparing with FTB), but also PLC chip waiveguides are transparent for a wide range of waive length (1260 nm.. 1650nm, in contrast to three windows of transparency at FBT). This exception can be used for difficult network using different multiplexing technologies (CWDM for example). Network topology is a first stage, so called basis of the basis. After specifying potential (or even quite real) subscribers and marking their location as well as potential location of OLT marking on the map, it is necessary to think about future network topology at once. In fact, many engineers have interest to PON right because of this technology "topological polymorphism"; It is possible to develop POT at each building density and its exceptions, you only need to know how. Specifically the expert choice of future network topology guarantees its further development and gross adds - thus the project in general. PON ( optical network directly) may be built on the basis of three main topologies ("tree", "star", "tire") and of their combination. The most developed questions in the projecting process are the questions connected with loss budget calculations while using particular topology. as well as these calculations comparing with optical budget of PON-system. We will try to understand what is better to build as well as for what and how. - minimal system optic budget. It is recommended to fulfil minimum of parameters while calculations of any optic connection system and PON is not an exception. The fact is that during equipment manufacturing on factories, final equipment test on many parameters is fulfilled, including transmitters capacity. And as during mass production laser calibration to the state of full identity is expensive and laborious process, more often limits of allowed radiant power are specified and they are held. For example, in one supply of transmitters for ONU, power difference of two devices may reach two and more dBm, and that is why when choosing as basis more powerful example, is is possible to obtain dead mainstream as a result (for example, 60% of transmitters of the present supply will have less power than is incorrectly chosen sample power). All losses are needed to be calculated and to collect to the summary loss budget. - strange as it may seem, programming equipment capabilities ( in other words, maximal capability of subscribers on one OLT port). Often programming capabilities and optic budget are closely connected. For example, standard GEPON decisions from Chinese manufacturer BDCOM intend optic budget near 30dB when maximal subscribers quantity to 1 OLT port that is equal to 64 (dividing losses of the root fiber to 64 lines is near 22 dB). As it could be seen, the reserve of 8dB must be more than enough as for mainstream, as foe connections. In practice, many engineers install transmitters of higher power (it was told about them earlier) and divide root fiber to 128 lines. Properly, the introduction part may be ended here and we can start to examine directly topology, its exceptions and calculation samples. 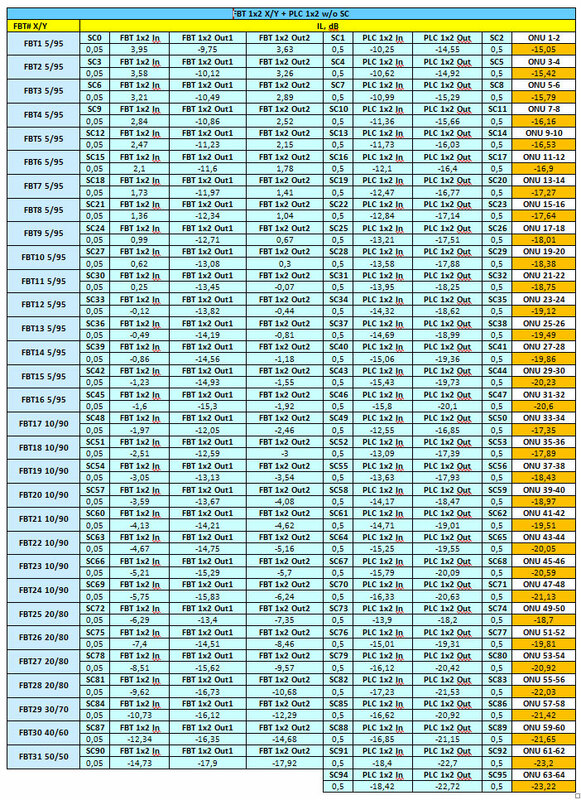 All calculation tables are at the very end in Addition A, to not to "lumber" the text ant to make it more readable. The most simple from the point of understanding, calculation and building is "star" topology. What "start" topology is, I hope I needn't to explain to anybody, but the building of the star has some essential exceptions in PON. In PON in classical view in any topology one root fiber is used (connected to EPON OLT port) to N subscribers ONU devices (to BDCOM N = 64; for other manufacturers the rates may differ). In other words, one PON-port OLT serves to 64 ONU. If all these ONU are within radius of 200-300 meters from some central point - it is possible to build the "star"! The simplest "star" is root fiber dividing to 64 lines, one line to each subscriber (essentially, technology "optic to the house"). Such "star" is suitable for private housing, which is full of old houses: one or two store buildings with 4-8 flats with high building density (and naturally, with a great wish of all housemates to use ISP services). To build the simplest "star" it is necessary primarily to choose the point, that is possibly equispaced from all potential subscribers. In this point will planar divider 1x64 situated. It is necessary to connect a cable to the divider from OLT site as less capacity, as possible (1 or 2 fibers). To connect a cable of larger capacity has no sens, because the divider 1x64 even in highest-density development will cover the larger living area of private housing and will provide connection up to 64 subscribers (and this is equal to 1/4 part of usual four ports OLT capacity). There are only two variants of connection. The first variant is most simple and less effective; output from division point of individual external patch-kord for each subscriber. In other words, there is a box, where OLT cable incomes. There is the 1x64 divider in the box. When new subscriber connecting, a special trained person assets to the box and connects already built patch-kord with one of the dividers outcomes. This variants bad site is such box maintenance discomfort. The problem is, that "special trained persons" don't usually keep dividing boxes clean and in order. Add to this mainly uncomfortable situation of such dividing box on the pole and you will receive a well known by all of us thing: when 20 subscribers are already connected, the box begins to look like "bed head". Negative sites are clear: subscribers patch-kords don't signed, it is not clear what and where goes, the box doesn't close and there is complete disorientation in general and it looks inaesthic. The second variant is more effective: the house or a group of close built houses are chosen and quantity of potential subscribers in them is calculated. From the box in destination of these houses deflects a cable of needed fiber (maybe with little budget), that connects from the one site to divider outputs. The other site of the cable boils soft quite near subscribers group (it is possible to use smaller box for this, for example PON BOX 12 or 16) and subscriber patch-kord enters directly to the house (fiberdropcable). Everybody are happy. Summary length of optic fiber, that "includes" to the final optic budget (when attenuation 0,36 dB/km on waive length 1310 nm): 4,5 / 0,36 = 12,5km. Thus, even if OLT is situated on 5 km distance from the divider, subscribers up to 7,5 km distance are inside influence radius of that same divider! There not much variations of "star". Actually, there are two of them: "star" using 1x64 divider and "star" using dividers group 1x32+1x2 (all other or "trees" or derivatives). - to cut the cable and to bring both fibers out of it to two dividers in the same box; - to cut the cable and to bring one fiber out to the box with the first divider 1x32, and to start the cable with the other fiber further out, by transit to the next box. Thus, it is possible to cover oval area. With loss budget in case of star 1x2+1x32 everything is in order: even using large quantity of mechanical connections (let them be 3), the system "prowls" through optic budget 30dB (4,3+21,5 + 0,5*3 = 27,3dB). In spite of all effectiveness, the "star" is seldom used: conditions to its developing must be too ideal, and it is ineffective to do radius of this star more than 300-400 m because of large quantity of subscribers external patch-cords (the first case) or because of multifiber optic cable (the second case). As far as GEPON of classic type has tree-type structure, it would be crime not to pay attention to this topology. Tree-type topology intends the presence of such topological elements, as "root", "body", "branches" and 'leafs" by itself. - "sub-tree" - "sub-tree" - passive optical network, connected to one certain OLT EPON port. The "root" of tree-type structures is proper OLT, from which "grows" a passive "tree" (that consists, as we remember, of subscribers "sub-trees"). The "body" of the passive tree is usually the most thick (read: most capacious cable, installed from the "root" to the first (root) divider. As "branches'" it is possible to consider optical of cable-type containers, installed on the all distance from the root divider to "leafs". As "leafs" appear all ONU and all installed behind ONU subscribers equipment. *Thus, on the basis of one Low-Level BDCOM OLT (that has 4 EPON ports) it is possible to build one tree that consists from for sub-trees with summary capacity 256 subscribers (64 subscribers to each sub-tree). Directions and geographic position of the tree is in accord with bub-trees in it (for example, passive tree "grows and branches out" to the north only from the root). Sub-trees are "growing" independently from each other (for example, the first tree is "growing and branches out" to the north from the root, the second one - to the north-west, the third one - to the south...). The first type of trees are four-in-one tree, which root, body, branches and dividing nodes are "lay" on each other and geographically are the same point or line. Trees of the second type is used by geographically independent dividing nodes, i.e. sub-trees are "growing" so to speak apart from their other brotherhood, having at the same time the common root. In other words, the difference is that the first tree type (multi-tree) has larger subscriber capacity (256 and more) and uses the common mainstream cable (4, 8, seldom – more fibers) for servicing the subscribers, and the second type services to 64 optical subscribers on each direction using separate cable. Using the first tree type (multi-tree) it is possible to build powerful and very capacious infrastructure in the whole residential area (possibly, even in not large bedroom suburb); using the OLT group on provider site and one mainstream tree. The second tree type is logic to use for providing connection to not large local districts (to 4 independent districts on one Low-Level OLT). The first thee type («multi-tree») is more elegant, but more difficult from the projecting point of view. Essentially, that particular tree type is classic of passive tree-type networks building. Classic PON-tree is comfortable to build in not large residential area or in residential districts with large building area and large quantity of potential subscribers, geographically situated near to each other. The main task of design engineer when building future network "multi-tree" type topology is experienced choice of dividing nodes location. This is because until the last (subscriber) dividing node, the body and branches of the multi-tree will contain fibers of all sub-trees included to the root in it. "Multi-tree" branches must cover all area of intended district of connecting, and leafs, as in all other cases, are rendered suitable for subscribers connections. It is comfortable to project such passive network, dividing the residential area to squares (check-row) and installing 1xM divider at the center of each square, that provides signal transport to M directions inside this square. (Figure 9). In fact, the network will looks like N independent sub-terrs (N is divisible to EPON ports quantity in multi-tree root, and, corresponding, to fibers quantity in the cable) in one physical tree. After main dividing nodes are specified and the cable is installed, step-type "multi-tree" developing begins. In the root N-fiber cable, that is directed from provider station to subscribers dividing nodes, the first fiber is using (the body of the first sub-tree begins to grow). This fiber connects In all dividing nodes by necessary nodes (the first sub-tree begins to branch out), and other fibers is staying "lacerated" (Figure 10). Thus, the first from N subtrees in the "multi-tree" becomes active. Figure 10 - main dividing node when topology PON "multi-tree" type developing. As soon as any of subscribers divider (from where subscribers connections "leafs" are growing) is completely filling by subscribers at specified direction, the second from N trees begins to develop at the same direction until all fibers in all directions will be filled. "Multi-tree" may be built on the basis of any dividers: FBT 1×2, PLC 1х2, 1х4, 1х8, 1х16. PON-tree conception assumes, that the passive network may be built on the basis of any dividers combination taking into account the main rule observing: it is impossible to divide each sub-tree more than to N subscribers observing system optical budget. The main "multi-tree" positive site is fiber economy and a new subscriber connecting simplicity. Main negative sites: First projecting complexity and risks that are connected with possible subscribers quantity wrong planning. On Figure 11 there is second tree type. There are a lot of such type topology variations, but it is presented the simplest case for perception simplicity, that to only vaguely resembles FTTX. A 1x8 divider installs on the provider site, right after OLT, that connects by its first site to the OLT PON port and by its other site to the eight fiber cable, that plays the future sub-tree "body" role. As may be necessary, the "body" is cutting, one fiber is branching off and developing, from which a "branch" for 8 subscribers begins to grow, and the other fibers are installing further. Each branch from the general mainstream of the sub-tree may be performed using 1x8 divider or 1x2 and 1x4 dividers combination. The main positive site of the second type tree is network building process understanding simplicity. And then, the other tree type provides relative comfortable exploration of the certain direction: one port for one residential district with branch possibility "at the place". The main negative site is fiber economy conception deviation in favor of network topology fulfillment simplicity: several independent multi-fiber mainstream cables are using (one for each EPON OLT port) for passive network building under the one OLT control (read as: one passive tree of such type may have only ONE root). A) "Optical budget rule": it is necessary to "put" optical loss budget into the minimal optical system budget. In this respect, it is desirable to leave 3dB "as a reserve"; B) "Dividing to N rule": Nor fiber, coming out of PON OLT port, must be divided to more than N final fibers, and not more than N ONU must be connected to it (it depends on system software capabilities). But, as practice demonstrates, not all dividers combinations are good. Let's examine the most popular combinations in digits (Figure 12). When each combination building and calculating, it is most correct to use combine "mechanical-welding" methodology of dividers including: Divider income is welded to root UpLink fiber, and outcomes are connected to DownLink fibers (branches or subscribers patch-cords) by mechanical connection of SC/UPC-SC/UPC type. The most popular "tree" type topologies are shown below, numeric data of which may be found in attached tables, shown as example. 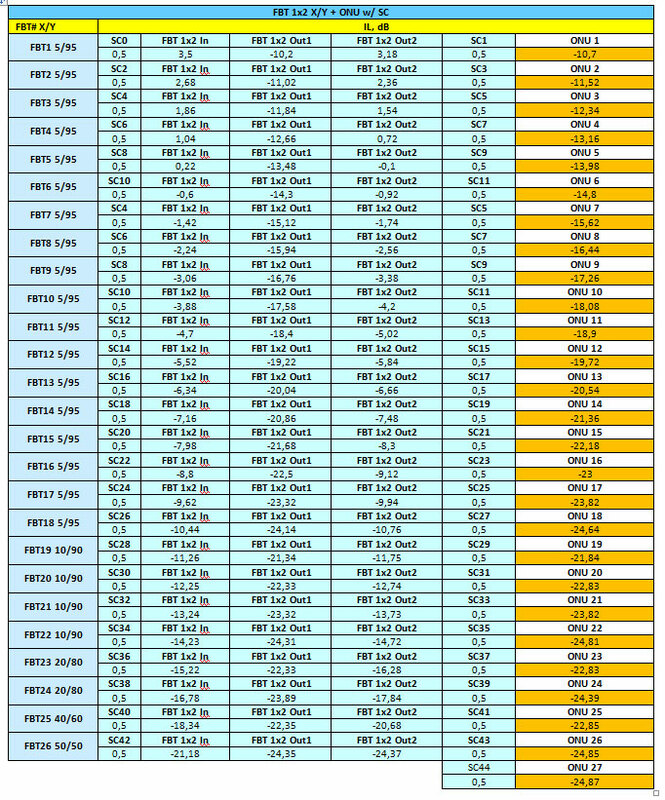 Each table with calculations includes SFPOLT connection losses with sub-tree root fiber, as well as "subscriber patch-cord - ONU" connection losses. Figure 12 - Main methods of passive tree branch. 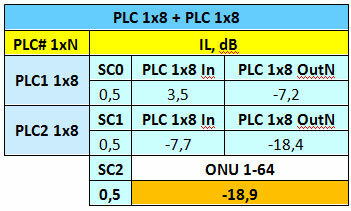 PLC 1×8 + PLC 1×8. The most popular dividing set for tree-type topology of any type. For one tree complete loading (64 subscribers for one EPON port of BDCOM equipment) 9 dividers are needed: one root + eight subscribers (see Figure 9 and Figure 12). For the standard "multi-tree" complete loading for 256 subscribers (now and further, for BDCOM equipment), that is built according to principle "1x8 + 1x8", it is needed 36 units of these "1x8" (see Figure 10, Figure 12). 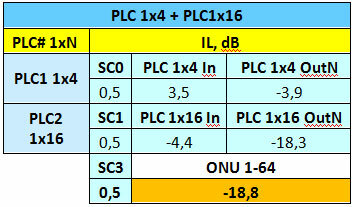 As for the loss budget and final optic budget, it is specified in Table 3, where signal level rates after each tree element are shown (SC/UPC-SC/UPC mechanical connections and dividers 1х8). We remind that, as basic power rate, the power 4 dBm is installed, and the minimal ONU sensibility according to the passport is equal to 26 dBm. As it could be seen from the Table, the tree 1x8 + 1x8 has normal rates according to the power losses. The final optic budget ~7dB may provide the tree depth to 19 km (not including weldings, kinks, etc.) when attenuating on the waive length 1310nm = 0,36dB/km. The quite comfortable topology for living areas, where subscribers are situated quite close to each other, but each subscribers group is isolated from each other same groups (Figure 12). Dividers set 1x4 and 1x16 may be used in two ways: or to divide the sub-tree root to four branches first, and than to divide each of them to 16 of vise versa (first to 16 and than to 4). As first, as second method has its followers. The loss budget is the same: changes the order of the addends... so, you know. Dividers quantity for the first case: 4 units 1×4 + 16 units 1х16. For the second case: 4 units 1х16 + 48 units 1х4 (naturally, for 256 subscribers in multi-tree). Losses in the tree will be illustrated in Table 5. It is seen, that losses are the same, as when 1х8 + 1х8 are used (Table 3), and the network mobility also increases (in relation to basic topology 18 + 1х8). 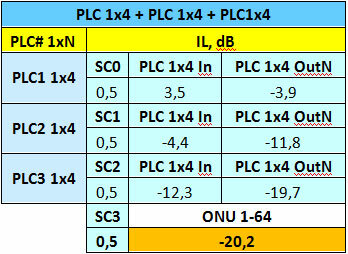 PLC 1×4 + PLC 1×16. The quite comfortable topology for living areas, where subscribers are situated quite close to each other, but each subscribers group is isolated from each other same groups (Figure 10). Dividers set 1x4 and 1x16 may be used in two ways: or to divide UpLink to four DownLink, and than to divide each of them to 16 of vise versa (first to 16 and than to 4). As first, as second method has its followers. The loss budget is the same: changes the order of the addends... so, you know. Dividers quantity for the first case: 4 units 1×4 + 16 units 1х16. For the second case: 4 units 1х16 + 48 units 1х4 (naturally, for 256 subscribers in the tree). Losses in the tree will be illustrated in Table 5. 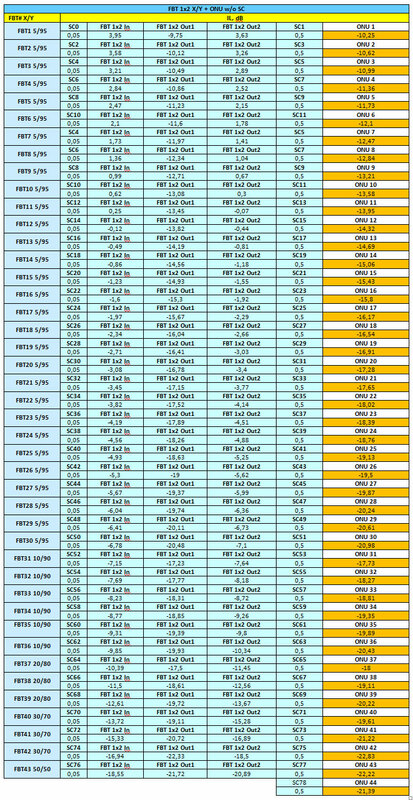 It is seen, that losses are the same, as when 1х8 + 1х8 are used (Table 3), and the network mobility increases many times. As in previous case, the loss budget is the same for all variations (see. Table 6). As it could be seen, ONU receiver power is close to the 1х4 + 1х4 + 1х4 variant (Таble 4), mobility is higher. One of the most "branchy" between most accepted topologies. In fact, all combinations, mentioned above are PONs "tip of the iceberg" only. Sometimes requirements are such, that instead of planar dividers 1x2 it is necessary to use welded with non-equal-arm attenuation coefficient on each output. Sometimes it is required a planar dividers cascade 1x2 (up to 6 dividers together). It is simply not possible to specify all possible combinations, and there is a positive side in it: we take area map, include fantasy and do the thing nobody never did! Optical budget will stomach! It is possible very often to meet small residential areas (village, small village etc.) in our "immense" motherland that are one or more parallel streets. It is no sens to develop the "tree" or the "star" in such residential areas: it is uncomfortable and expensive. The only one solution is "tire". "Tire" in GEPON networks develops on one fiber to each OLT EPON port using welded dividers 1x2 cascade with percentage ratio of outcome signals. Notwithstanding, the first divider income connects to OLT PON port, and the rest of cascade is building according to the principle "higher power-into the line", i.e. higher power of outcome signal enters the mainstream line and powers all further dividers cascade, and lower outcome power branches for subscribers connecting. But, as practice shows, it is uncomfortable to do one branch for the one certain subscriber. First, welding quantity on the mainstream fiber is increasing, that declines the signal quantity, on last cascade distances in particular. Second, the difficulty of new subscriber connecting to the center of already existing cascade is increasing: when connecting, welding works will be fulfilled, that will result to connecting absence at lower cascade. And the general attenuate scheme in the line will break, that may have negative influence to signal quality of last cascade subscribers. The solution in this situation is welded 1x2 dividers combining with percentage ratio of the outcome signals power and planar dividers 1x2, 1x4 and 1x8 (Figure 11). Herein the tire-type topology is keeping, but signal branch moves not to one subscriber, but to subscribers group, that may be situated in 200 meters or more radius from the planar divider. The presented scheme is comfortable, because when experienced network planning, the network becomes easily scale operated and the new subscriber connecting is fulfilled "in three steps": patch-cord installing of outdoor from the planar divider to the subscriber, patch-cord connecting to the divider, patch-cord connecting to the subscribers ONU. It is also accessible to use "tire" type topology in cases, when streets in residential places are quite capacious from the subscribers quantity position, and at the same time, have quite long extent. In this case, "closer" to the main station OLT subscribers are servicing by one tire (one fiber and one OLT PON port), distanced subscribers - by the other tire. Calculations an practice discovered, that the highest efficiency of "tire" type topology is when combine welded dividers 1x2 and planar dividers 1x4 and 1x8. To get the equally stable signal on all ONU, in the cascade welded dividers must be installed 5%/95%, 10%/90%, 20%/80%, 30%/70%, 40%/60% и 50%/50%. All "tires" calculations and pictures, that explain there building details, are presented below, Each "tire" variant is presented by to tables. 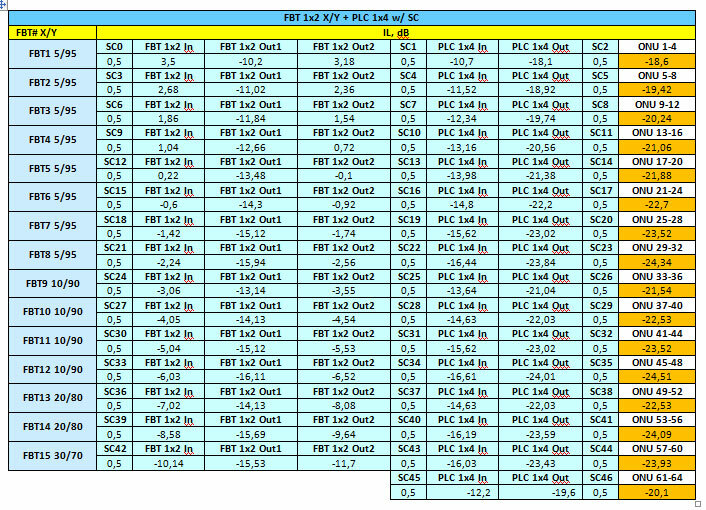 The first table includes calculations including mechanical connections of SC/UPC-SC/UPC type on all outcomes of welded dividers (Figure 14). The second table asserts FBT divider "welding in" into the line, and the connection between "subscribers" branches and subscriber PLC splitter is fulfilled by mechanical way (Figure 15). There are following rules of tables "reading": in lines dividing points are situated (joints, boxes, branches - as you wish), in columns - these dividing points elements. 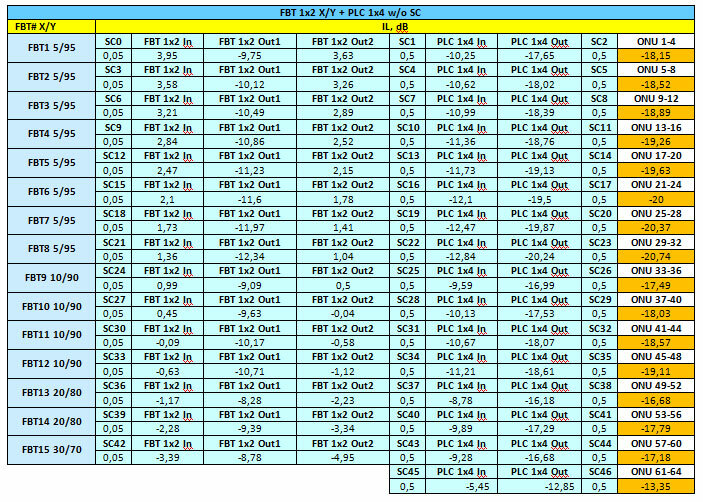 FBT dividers have two outcomes in tables (FBT 1×2 Out1 and FBT 1×2 Out2). FBT 1×2 Out2 ALWAYS have higher outcome power (lower attenuation) and connects (or welds) with mainstream fiber. FBT 1×2 Out1 connects or directly with ONU, or with PLC divider income (PLC 1xNIn). Mechanical connections between subscribers FBT outcome and subscribers PLC income are necessary for damaging radiating localization, that may cause all passive network breach (ONU "hangs" and radiates continuously, competitors "switch on" media converter into one of planar divider outcomes and made the OLT divider "blind" and so on). As it was said above, it has no practical sens to build classical "tire" (Figure 14), because one SFPOLT will service less than 64 subscribers because of large losses, which welded dividers 1х2 cascade brings into the mainstream line (Table 7, Table 8). After that, to cut the cable and to fulfill welding works even 20 times is already quite expensive, and it is also necessary to take into account welding quality, check each point and it will be quite difficult to search for a problem in case if breach, regret your welders/installers!). Figure 16 - Classical PON-"Tire"
As it seen from the table 7, it is no sens to build classical "tire" using mechanical connections on the mainstream line: the "tire" will include only 27 subscribers devices in it with final optical budget 1,2 dB, that will be enough only for 3-4 km of ideal fiber. table 8 is more positive (even 44 ONU for one SFPOLT, with power storage 3.5 dB! ), but it doesn't show tire topology development dynamic when connecting a new subscriber to already finished network. And connecting, as was mentioned above, may be quite problem, especially in the middle of working "tire". "Tire" with dividing on two. To make classic "tire" characteristics better, it (the classic "tire") may be combined with planar dividers 1x2 (Figure 15). It will minimize FBT dividers quantity in cascade on the mainstream line and will let (in several cases) to live a storage for new subscribers quick and safe connection. Figure 15 - PON-"tire" with dividing on two. Calculations illustrate tables 9 and 10. As it is seen from the table 9, mechanical connectors using on the mainstream line influences negatively to signal quantity (42 ONU maximum with final optical budget 1,25 dB). Without mechanical connectors, the system is able to work and has power reserve 3 dB. It is possible to build! "Tire" with dividing on four. With a help of planar and welded dividers 1x2 combination, as signal quality, as network scalability were made better. To increase the scalability, it is possible to use a combinations FBT 1х2 + PLC 1×4 (Figure 18). Figure 18 - PON-"tire" with dividing on four. As in previous cases, all calculations are in the tables (Таble 11 and Таble 12). When mainstream line mechanical dividers are used, all 64 ONU are "placing" into optical budget, at that 1,5dB are left for the growth deep. If abandon mechanical connectors, minimum 4dB is keeping, that is presentable rate as for the network growth, as for unexpected losses of different types. "Tire" with dividing on eight. In order to make the "tire" list complete as much as possible, the last FBT and PLC dividers combination for the "tire" is presented to readers attention: FBT 1×2 + PLC 1×8 (Figure 19, table 13 and table 14). Figure 19 - PON-"tire" with dividing on eight. As it seen from tables, the "tire with dividing to 4" and the "tire with dividing to 8" rates are practically identical, but, the "tire with dividing to 4" without using mechanical connectors, has higher power storage (4dB against 3,4dB). Also worth nothing is that no mentioned above tire does not pretend to be 100% usability - everything depends on location, where this "tire" will be built. It is possible to combine 'tire"-type topology by any means. The choice is under engineers, who will build and maintain a future passive network. It is interesting to note separately, that FBT dividers choice for all presented tire-type topologies is not sample and is shown as an example – when projecting, an engineer may discover more sucessful combination of welded dividers in main stream cascade. 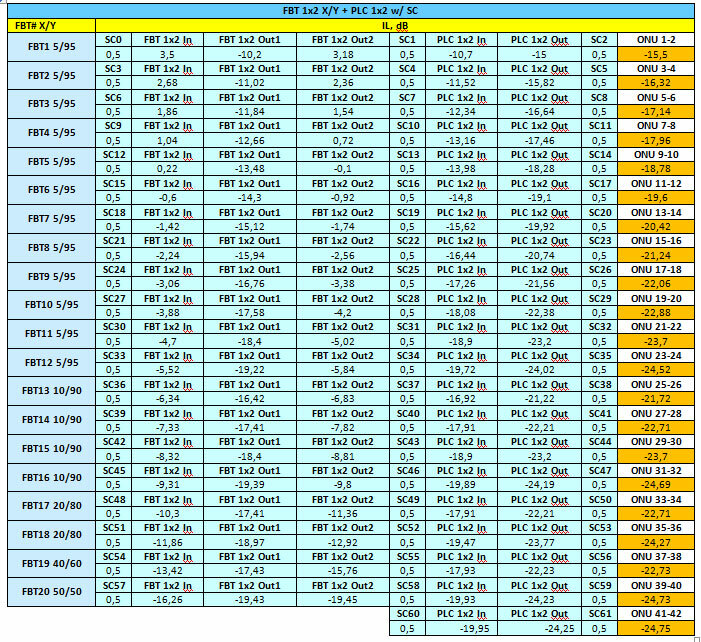 Here the main passive networks topologies overview may called as finished. It is no sens to overview all variety of possible topologies - the quantity of variations is very large. The main thing is to capture the essence and to experiment. 2.5 Using connectors in PON. As of the beginning of 2014, humanity discovered only two methods of two different fibers physical connection: welding with a help of special equipment and mechanical connection with a help ofconnectors (like SC/APC, SC/UPC or any other). *Anyway, mechanical connection fulfills with welding - connectors are welded to th fiber or at the factory, or manually at a place. So, in reality, the connection method is only one. We are not taking into account FAST-connectors - connection is less safe and usually has higher attenuation, as welding, and on most important links, engineers prefer the same old way using welding equipment of high quality instead of FAST-connector. When PON is built, the welder is necessary in any case - it is uncomfortable at least, to joint the mainstream cable together (for example, tree body and branches). Questions usually arise when divider installation. As in was mentioned above, dividers as completed product, are supplying from a factory in two types: with or without connectors. What type and where it is more comfortable to use - is a topic of the present part. Some words as for connectors for the beginning - they may be classified according to many parameters, including form-factor, but the main parameter when PON building is nevertheless the parameter, that is answerable for connector polishing (to be specific, its ferule). Ferule – ceramic (rare plastic) connector heart. Depending on how it is polished, connector's view and assignment are changing. Let's examine main polishes types on form-factor SC (Subscriber (Square / Standard) Connector, the very same «big dark blue/green square»). SC/UPC (UPC -Ultra Polished Connector) – standard square connector of dark blue color for mono-mode optical fiber (or of gray color for multi-mode). SC/APC (APC — Angle Polished Connector) – standard square connector of green color for mono-mode optical fiber. UPC type ferule is polished at an angle 90° to its long axis, and at APC is cut at angle 8° from UPC. APC type polishing is to minimize returned signal influence to useful (direct) signal in the fiber (Figure 20). Separately keep an eye on returned signal when PON building is necessary only in case when it is planning to provide the subscriber with CATV (analogue TV) together with traffic. In case, if CATV is planned to connect to the passive tree, all mechanical connections on signal's way from the provider to the subscriber, must be fulfilled using APC connectors. Otherwise, returned signal will bring aberrations into the main carrying signal, and a "dual picture" of video and other negative effects will be result. In case if it is never planned to use CATV - you can use mechanical PON connectors of UPC type when building. But it is better to think several times before make such decision, because the changing bosses nature may wish CATV tomorrow of their subscribers, and somebody of you will re-weld all connectors in the whole passive UPC network on APC! Each connector type has its adapters, in spite of no differences between adapters of one form-factor, but of different colors ( read as: intended for different polishes), except of color (UPC- dark blue, APC - green). Adapter is "pass-through socket", that has direction-pipe at the center for ferules and fastening connector mechanisms along the outline. Ferules are installed from the different sides of this pipe and fit to each other. Adapters are marking with different colors, exclusively for usability, in other words, "green" adapter may connect two "dark blue" connectors without consequences. If it is extremely needed to use connectors of different types, you should have some storage of patch-cords that from the one site are terminated by SC/APC type connectors, and from the other one by SC/UPC, but it is necessary to remember, that it brings additional losses. Coming back to the question whether to use mechanical connectors or to "weld" the passive tree, it is more logical to present the reader positive and negative sides of each method. fast topology changing (sometimes it is necessary, when the covered by the passive network district does not answer hopes - it is necessary to "replace" free fibers into the square with higher quantity of potential subscribers). In all cases, mentioned above (as in all other), the tree, that is built using mechanical connectors, is more vital because of it high mobility, providing by connectors. Intermediate solution is a practice, when each divider income into the passive network welds with mainstream fiber (UpLink), and outcomes are connected mechanically with DownLink. It lets to minimize general loss budget, leaving the network mobile at the same time. when standard passive network building, to use terminated dividers, cutting connector on income pigtail and welding it with UpLink. 2.6 Dividing nodes installation in PON. Until the residential place the Uplink cable installs usually under the ground, but people don't let to "excavate a trench" in the residential place through their land/house/street that is why, the only one way to build PON in very residential place is to install the cable on poles. At the same time, one of tasks, very often leaved out of account when PON projecting is dividing nodes provision task. During building the problems, that were considering when projecting only as "we will decide later what to do" are arising. Mentioned below problems should be discussed when making decision as for topology to be built and be discussed at that time. As such, it is about boxes. Strange though it may seen, boxes play as important role in PON, as dividers ( as such dividers are put in boxes). The fact is that the optical divider is tender device and if it is not hided into something thick and covered with a lock, device may be damaged with deplorable consequences for the network (as well as with accompanying problems at subscribers and, as a result, at ISP). Moreover, a lot of cables, that commutate with splitter by welding or mechanically, are in dividing point. For experienced commutative isolation it is necessary to subscribe cables, to put them, to store splice-cassettes somewhere and so on. In general, the box must be at dividing node. There are several methods to install dividing node, but there is only one correct. Let's begin with incorrect methods. So, the first method – is to use standard non-hermetic box for active equipment (BK-520 for example), that is active using when FTTH building. It is possible to install some optical patch-panels in such box (4x16 for example), to hide under the cover, connect the cable there and to lock it. The positive side of such method is dividing point scalability: you install the fiber into the dividing point in the splitter 1x16 of patch panel and install it to all subscribers. Subscribers quantity is more that 16, you install the second fiber and fulfill the previous item. dimensions and weight. "Active" boxes are usually for some L2 switch installing, with 1U 19" dimensions. Such boxes are made of metal, and patch-panels are also made not of paper, so the weight of assembled box will kill the mood (as possibly the health) of all servicing personnel. To fix such construction on pole is quite difficult, as well as to maintain. environmental protection. Here everything is as simple, as possible: boxes for FTTH are usually for room placement or under covers, it will not be so easy on poles: rain, snow, sun, birds, insects and other nature beauties don't let use non-hermetic metal boxes in the open air. The second method – using hermetical joints. Of course, hermetical joint is good, but initially it is intended for installing in the ground or canalization (though you can meet it on poles). small quantity of cable outcomes. Usually joint has 3-4 (seldom more) outcomes. It is necessary at least three for PON, usually 10,14 or 18 (two for the mainstream cable and 8...16 for subscribers). Correct method – FTTH/PON-box using. FTTH/PON-box is not large hermetical plastic box, developed especially for passive networks building. They may be for 8, 12, 16 subscribers outcomes (more seldom - more or less than mentioned rates). There is a place inside for splice-cassettes installing, boosters for cable supports and additional spaces for liners (Figure 22). Figure 22 – Placement of1х8 в FTTH/PONBox 16 divider. Actually, these white boxes were projected first for passive PON-networks components placing in them. But using of FTTH/PONBox is not limited by placing splitters only in them: "It is possible to put anything into this potty!". It is possible to use the box for placing there an active equipment, for example ONU, media-converter, uncontrolled switches and other.